A system is described for simulating environmental sound in interactive virtual worlds, using the physical state of objects as control parameters. It contains a unified framework for integration with physics simulation engines and synthesis algorithms that are tailored to work within the framework. A range of behaviours can be simulated, including diffuse and nonlinear resonators, and loose surfaces. The overall aim has been to produce a flexible and practical system with intuitive controls that will appeal to sound design professionals. This could be valuable for computer game design and in other areas where realistic environmental audio is required. A review of previous work and a discussion of the issues which influence the overall design of the system are included. In everyday life, we experience a range of complex sounds, many of which are generated by our direct interaction with the environment or are strongly correlated with visual events. For example, we push a pen across the table, it slides then falls off the table, hits a teacup, and rattles inside. To generate even this simple example convincingly in an interactive virtual world is challenging. The approach commonly used is simply to match each physical event to a sound taken from a collection of prerecorded or generated sample sounds. Even with plentiful use of memory, this approach produces poor results in many cases, particularly in sections where there is continuous evolution of the sound, because the possible range of sounds is so great, and our ability to correlate subtle visual cues with sound is acute. Foley producers have known this for many years. When the audio-visual correlation is good the sense of realness and immersion can be much better than either audio or visuals alone. Conversely, when the audio-visual correlation is poor, this can worsen the experience. In the interactive case where we have the ability to control the sound objects make, this correlation becomes more critical, as our attention is more acute. The phrase physically motivated audio is used here as short-hand for the use of the macro physical state of the virtual world to provide the controlling information for the underlying audio processes. The audio processes model microphysical behaviour that consist of the audio vibrations and physical behaviour too fine to be captured by the macro system. The macrophysical interactions that can occur in virtual worlds can be managed by integration under constraints, for which there exists a large literature and a range of dedicated physics engine software libraries, both commercial and open source. These implement a wide range of techniques, but appear broadly similar to the application developer, with some differences of interface and data organization. In the context of virtual environments, procedural sound or generative sound refer to algorithmic sound synthesis in general. This includes synthesis that is not visually or haptically correlated, but can be parameterized and coded compactly. Weather sounds for example require constant variation and controls for selecting the current prevailing conditions. The advantages must be weighed against the quality of the sound compared with sample-based sound. If there is no audio-visual correlation, procedural sound may not be preferable to sampled sound. In the following, we focus on physically motivated sound, where the advantages of procedural approach are clear. Examples of physically motivated audio can be found in the early computer games, such as Asteroids in which physically modelled collisions occur between objects moving in zero gravity (Asteroids is a video arcade game released in 1979 by Atari Inc., conceived by Lyle Rains and programmed and designed by Ed Logg. We overlook the fact that sound cannot travel in empty space!). Hahn et al. presented a dedicated rendering framework for sound in conjunction with computer animation, including examples such as multiple impacts on a drum . Van den Doel et al. provided the first detailed sound synthesis examples driven by a rigid body physics simulation  that included continuous contact interactions as well as impacts. Object resonance is modeled with modal resonators, which had previously been successfully applied in musical applications simulating struck objects . The parameters for a modal resonator can be very compact. 0.1 KB is enough to encode 10 modes whereas 100 KB is required to store 1 second of CD quality audio. Also, the spectral output of a modal resonator can vary constantly because the states of the modes are independent. This variation is often subtle, but it reproduces an important audio signature found in real resonators, which would be very expensive to emulate with samples. The surface is modelled using a profile that is resampled according to the speed of the contact relative to the surface and then filtered to reflect the amount of slippage, which is the relative speed of the surfaces at the contact. If surfaces are just slipping or scraping, there is little or no filtering. If the surfaces roll over each other, there is no slippage, and the interaction is less energetic. This is reflected with filtering that attenuates higher frequencies. This work has opened up avenues for further development and improvement. The original contact model does not work well with more complex profiles, because at lower speeds, micro impact are smoothed out, while for real surfaces, micro impacts generally retain some impact character at lower speeds. More physically detailed contact models have been developed that include the instantaneous interaction between resonating components in contact . These can generate very good results for some kinds of interaction, but are computationally more complex, and prone to instability. Being physically explicit, they are not easily tailored to fit the behaviour desired by a sound designer. Any framework supporting such contact models would need to closely couple the resonating objects, which would greatly complicate the design. It is possible that future physics engines may be sufficiently precise to implicitly execute models such as these; however, given that engine development is mainly driven by graphics, this is unlikely in the near future. There are many interesting surfaces that are not fixed, such as gravel, crumpled foil, sand, leaves, and water. These would be expensive to model as part of the macro physical simulation, and so simplified models that provide good audio results are sought. In the case of water, the sound from many individual bubbles has been synthesized. On its own, this approach is not very convincing and quite expensive . With a fluid dynamics simulation controlling the bubbles, the sound is very realistic but very expensive . Clearly, there is a need for an inexpensive approach that is convincing and can be modified by the sound designer in a flexible way with reference to recordings. Cook has provided examples of synthesis of foot fall on loose surfaces, made by analyzing recorded surface sounds to generate parameters for filtered granular processes . It would be valuable to adapt these kind of techniques to a physics-enabled virtual world. Modal resonators are very efficient at modelling objects that have a few prominent modes, such as ceramic and metal blocks and containers. Modes can be fitted readily to recordings of such real objects being struck, and each mode has intuitive control parameters, amplitude frequency, and damping. Modes are easily removed or added to simplify or enrich a resonator. Modal resonators are less suitable for more diffuse resonances that are often encountered, such as wooden furniture or large metal panels. In addition, many resonators exhibit noticeable nonlinear behaviour causing pitch glides, spectral migration, or internal buzzing or rattling effects, which would add interest and realism. Research in musical synthesis provides examples that address some of these problems using synthesis methods such as 2D waveguides  and finite elements , but at much greater cost. 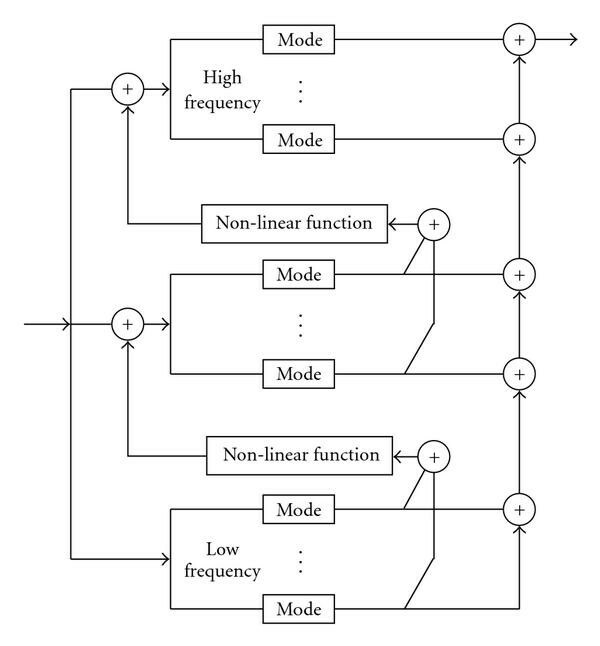 More recently, nonlinear interaction between modes has been shown effective for synthesizing environmental sounds, but with significantly higher costs compared with linear modes [10, 11]. Resonator models are needed that can generate this range of behaviour with the high efficiency, stability, and flexibility required of a virtual world. This may require some compromise of sound quality, which is acceptable for a virtual world setting although possibly not in a musical one. A framework should facilitate the appropriate signal flow between audio processes and manage the resources. The user should be protected as far as possible from the internal workings including communication with the physics engine and should only have to specify the audio properties of the objects in the virtual world. The software library Phya [12, 13] (online materials are accessible from http://www.cse.dmu.ac.uk/~dylan/) has been developed to meet these requirements and includes a range of audio processes that address the limitations cited in the last section. C++ is chosen as the main language for simplifying use with physics engines and applications (there is now a Java port by Sam Bayless, JPhya hosted at Google Code, created for the Golems Universal Constructor application http://www.golemgame.com/). Van den Doel has also developed a Java framework, JASS , which provides useful set of objects for building audio processes. However, it has not addressed the problem of integration with a physics engine, or the further development of audio processes. For sound designers who are not programmers, it is necessary to provide graphical interfaces that expose the underlying programming interface in an interactive environment for authoring object audio descriptions and a way to import these descriptions into Phya. The more interactive the interface, the faster the design process becomes. This need has been considered by an associated project called VFoley  in which objects can be manipulated in a virtual world, while audio parameters are adjusted. Physical principles guide the system design, combined with judgements about what is perceptually most relevant. This has previously been a successful approach in physical modelling of acoustic systems. A simple observation can lead to a feature that has a big impact. Evaluating a sound generator objectively is not straightforward. A generator is a function returning sound histories from input histories, which is a much more complicated object than a single sound history, a sample. This is what makes modelling so interesting. Nor is it clear how to generalize features that are important, and it may be that no such generalization can easily be made. Even if this could be done, would it be all that useful? It would not have the same significance, for instance, as objective quality evaluation of mp3 recordings. The sound designer is often more interested in the freedom to shape the sound how they would like, rather than exactly matching a real behaviour that may not be quite suitable. The remainder of the paper begins by describing the framework and global processes and then the audio processes associated with collision and resonance. Practical aspects are highlighted, and we omit details such as standard filter forms that can be obtained from the references and standard texts. The structures are robust, and the reader will be able to reproduce the results described without fine tuning. The source code is also available for reference, and most of the features discussed are implemented although some are experimental. For the developer, the framework should provide a set of concepts that simplify the process of thinking about and programming audio interactions without overly restricting their scope. A layered structure is desirable in which more complex features are accessible, but this can be overlooked initially. This can complicate the internal structure of the framework, but it also means that the process as a whole can be carefully optimized and ordered without laying those tasks on the user. Because there are several different physics engines that might be used, all with similar features but with variations of interface, an additional integration layer is required for each physics engine used with the main audio library, Phya, as shown in Figure 1. The integration layer includes the update function for processing the physics engine collisions and callbacks to process expired collisions. These functions access lower level functions in Phya that are not normally accessed directly by the application developer. The audio is generated in a separate thread, which sleeps until a waiting audio block is ready to be sent, and a new block can be calculated. Components in a Phya application. Arrows point in the direction of function calls. The normal usage of Phya in an application can be summarized by the following steps. Define audio properties of audio objects. This is the main task for the user. Link physical objects in the physics engine to the audio objects. This can usually be done with user tags in the physics engine. Initialize Phya. Setup any callbacks; for example, if the physics engine supports a destroy contact call back, this can be used by the integration layer. Start the audio thread. In the main simulation loop, update Phya with collision data each physics step. This is a function call to the integration layer that queries the physics engine and updates the Phya collision state, which is in turn used by the audio thread to generate audio. A decision that must be made early on is the kind of signal flows that are supported between objects. For a real contact, the resonators may interact instantaneously, which requires direct signal flow in both directions between the resonators. It was decided not to support this, because it complicates the connective structure while not greatly improving the audio synthesis possibilities. Signal flows can then all be vectorized. Performance is improved further by minimizing the use of sample buffers in order to improve cache hits. Buffers are held in a pool so that the last used buffer can be immediately reused elsewhere, in contrast to the static buffers commonly employed. This has significant impact in a dynamic environment, where objects are being frequently activated and deactivated. Physical systems are naturally represented by class structures. Phya is based around a core set of classes, that can specialized and extended. 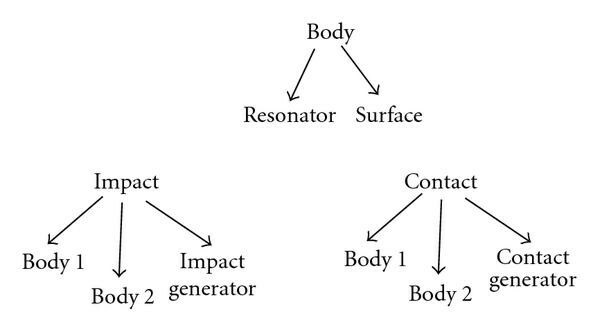 Each sounding object is represented by a Body object, which points to an associated Surface and Resonator object; see Figure 2. A surface specifies how a collision will be generated on that surface. On a given surface, any number of collisions with other body surfaces could be occurring at any time. Sharing surfaces amounts to sharing surface descriptions. Resonators actually embody the resonating state, so normally, each body has a different resonator. Sharing a resonator between several audio bodies is a useful way to save computation when the physical world contains several similar bodies close together. Main objects in Phya, with arrows pointing to referenced objects. Collisions are managed by Impact and Contact objects that are dynamically created and deleted as collisions occur between physical objects, so the minimum resources are used. Impacts are momentary collisions that might occur for instance when two objects bounce off each other, while contacts are sustained collisions such as sliding or rolling. Impacts delete themselves when they have finished, while contacts are managed according to the progression of the physical contact. The physical contact corresponding to each active audio contact needs to be tracked and used to update the audio contact with dynamical information. An audio contact should be deleted when the physical contact ceases. Each Surface class has associated ContactGenerator and ImpactGenerator classes for generating the particular surface sound. When a contact or impact is created, it creates an appropriate generator for each surface, which is deleted when it is deleted itself. Pools of contact, impact and generator objects can be preinitialized to increase simulation performance. The Bullet (http://www.bulletphysics.com) physics library has been adopted for recent integration development with Phya. Integration is discussed here generally and with particular reference to Bullet. When contact occurs, a region of intersection of the colliding objects is created. The nature of the region depends on the geometry of the surfaces, the main cases being vertex-surface, edge-surface, edge-edge, surface-surface, and related cases using curved primitives, cylinders, and spheres. In the edge-edge and vertex-surface cases, the region of intersection is small and represents the single contact point that would occur between ideal impenetrable surfaces. In the surface-surface case, ideal contact is distributed over the surface, and in the edge-surface case over a line. For audio simulation, the variation of contact parameters over the distributed region should be considered. For instance, a block spinning flat on a face may have zero speed relative to the ground at one corner and a maximum value at the other end. Bullet and other similar engines track a small group of manifold points that span the contact region and approximate a region of uniformly distributed contact force. These points tend to stay at fixed positions for a few frames then disappear as the contact region shifts and new points appear. At each contact point, there are several physical parameters that are useful for generating collision sound; see Figure 3. Engines usually provide the total impulse for the simulation frame. For impacts, this can be used directly. For contacts, the force is estimated by dividing the impulse by the time between physics simulation frames. The distinction is more important if the simulation time is adaptive. Physical parameters at the contact. Signal routing at one contact. the cross product of the body angular velocity with the position vector of the contact relative to the body centre of mass plus the velocity of the centre of mass. Velocities generated by the engine generally behave well, and they are smooth enough to control audio processes. It may not be easy to choose a representative surface point in the region, but the variation in velocities will not be so great to be noticeably unsmooth, especially given the collision synthesis described later. Also of interest, but not always necessary, is the contact speed relative to each surface at a point , where is the velocity of the contact point. This quantity tells us how quickly surface features are being traversed, and this is particularly important in cases where zero slip conditions may still result in surface excitation, for example, when rolling. is harder to determine than the slip speed, and there are several possible approaches, with varying degrees of accuracy and smoothness. Contact generators such as those that use sample playback require high smoothness, while others such as stochastic generators are much more tolerant. where here is the angular velocity of the plane surface body. A general curved surface is represented at the contact by two orthogonal curvature directions and two centers of curvature. 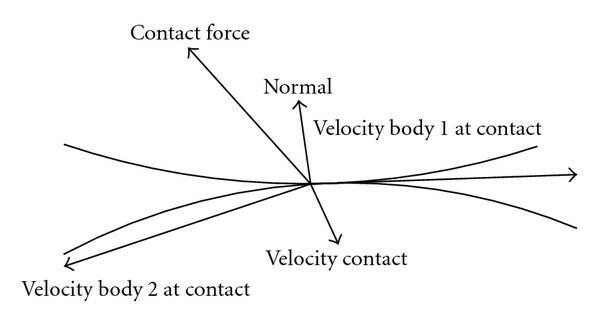 To solve for the contact velocity, the angular velocity of both bodies is required, and the complexity of the calculation is not justified by the limited range of application. A simple but useful smooth approximation to the contact velocity is to equate it with the centre-of-mass velocity of the body which has the highest curvature at the contact. This can fail for geometrically complex scenarios, such as a disk spinning on a surface with a fixed centre of mass. Another approach is to numerically differentiate the contact position. With a single manifold point, this can work well. If there are several points, a representative contact position can be calculated from an average of the point positions weighted by contact force or penetration depth. If the surfaces are polygonal a differentiated contact position may jump in a way that is not intended or evident in the graphics displayed. To smooth the calculated velocity, it is best to smooth the positional data before differentiating. This introduces some latency whose effect is masked to some extent by the dominant low latency contribution of the contact force to the excitation. An impact can be detected when a collision is new and the normal relative velocity at the contact is above a threshold. It is common for an impact to be immediately followed by a contact, but it is also possible for impacts to occur without an associate contact and vice versa. Contact generators may have internal state that must be updated using data from the associated physical contact. So, the matching physical contact must be tracked for each acoustic contact. The simplest way of ensuring this is to make use of user tags on physical contacts, pointing them to the acoustic contact. In Bullet user, data is available for each manifold points, but these are not fully persistent over the life of a contact region. The Bullet source can be modified to add a user data member to the persistent manifold structure that owns the manifold points. A callback function can be added to intercept deleted contact points. When there are no longer any manifold points, the contact region has disappeared, and the acoustic contact can be deleted. A less efficient alternative that can only handle one contact region for each body pair is to form a hash function from body pairs to acoustic contacts. The acoustic contacts are then retrieved by enumerating the physical contacts, each of which refers to a body pair. The signal routing allows sound generated at each surface to feed the resonator of both colliding objects, as well as adding surface sound directly to the final output. The signal can also be routed between resonators to simulate acoustic transmission, as one might find in a compound object of different materials. It is preferable to keep spatialization as separated as possible from sound generation, if possible. A large body of algorithms and software exist for spatializing, and the best approach depends on the context of the application. Output from Phya is available as a simple mono- or stereomix, or separately from each body so that external spatialization can be applied. A source can be given directionality by filtering the mono signal to produce a signal that varies with direction from the source. This technique is often used in computer games and can be applied as part of the external spatialization process. However, it does not capture the full degrees of freedom available to a source in general. To do this, the synthesis process for each body must generate directional components, which in the most general case can be encoded using spherical multipoles, . For a simple linear resonator, this is not required. Monosynthesis followed by external filtering can reproduce directional sound correctly, because at each frequency, the directionality is fixed. For sources in general, the directionality at each frequency can vary over time. When the listener receives room reflections in addition to the direct signal, which is usually the case, the pattern of reflections depends on the directivity of the source . This effect occurs for both linear resonators and general sources; however, it can be more pronounced for the general case, as the pattern of reflections is more variable, . This effect provides more compelling justification for implementing internal directional source synthesis. The damping of a body resonator is often effectively increased when the surface is in contact with another surface. This provides a dynamic variation of resonant behaviour that is characteristic of interactions between several objects and provides useful cues about the state of the system of objects. Damping is implemented globally by multiplying damping factors from each surface onto each resonator it is contact with, up to a maximum, prior to updating the output of the resonator. This is a simple model that ignores many interactions that can occur, but it is effective in linking the audio state of each body to its environment. The hardness of a collision depends on the combined hardness of the surfaces. A collision between a soft object and a hard one produces a soft collision. Like damping, collision hardness provides important cues to the relationships between objects. To simulate hardness, the collision framework must process parameters from both bodies. The details of this are described in the impact section. The unpredictable nature of physical environmental sound requires automated level control both to ensure it is sufficiently audible and detailed and also not so loud to dominate other audio sources or to clip the audio range. In some cases, it is desirable to emphasize a sound relative to others, due to the user's focus on the corresponding object in the virtual world. In conventional sample-based game audio engines, compression and limiting are already very widely used for these purposes. Physically modeled and motivated sound increase this need further. Limiting can be applied first to the dynamic control parameters, force, and velocity that feed the generators. Then, each output stream can be limited using a short look-ahead brick wall limiter that can guarantee a limit without artifacts. The duration of a single audio system processing vector, which is typically 128 samples at 44.1 KHz, provides a suitable amount of look-ahead. An impact is a collision over a brief period during which there is an exchange of momentum between the bodies. A clean impact consists of a single pulse, but longer, more complex functions are common. The dynamics of an impact depend on a combination of the properties of both surfaces. If the surface elasticity is modeled by linear springs with constants , , then the combined spring constant is . Taking to be the lesser value of and is a useful approximation. 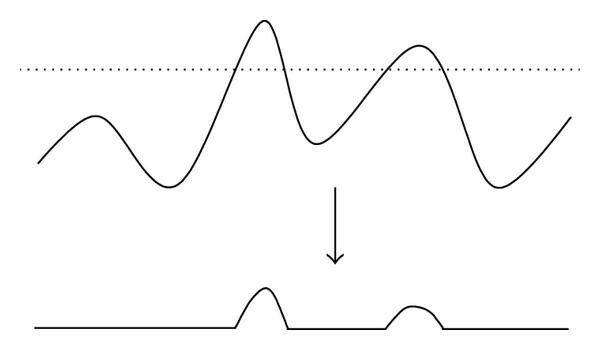 The impact displacement follows a simple harmonic motion, which lasts for half a cycle, as shown in Figure 5. By considering the centre-of-mass frame, the duration of the impact is , where is an effective mass . The duration is independent of impact velocity, and the effective mass can be approximated by the lesser mass of and . If collisions only occur between objects of similar mass and possibly the ground, then effective mass does not vary much and can be ignored. The impact displacement amplitude is , where is the relative normal contact speed. To give the sound designer more freedom over the relation between collision parameters and the impact amplitude, a piecewise linear scheme is used, with an upper limit also providing a primary stage of audio level limiting. Displacements from three impacts, one of which is stiff. 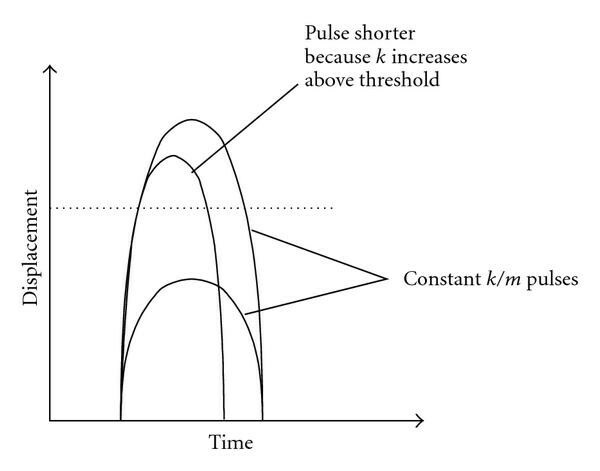 Real surfaces are often stiff, meaning they can be modelled more accurately by a spring constant that increases with displacement, causing reduced duration and a brighter excitation, as shown in Figure 5. As well as adding realism, this provides important natural listener cues to the excitation level and source loudness of the object, and also therefore to the object location, by comparison with the apparent loudness at the listener. Impacts are often complex rather than simple pulses. This can be due to the complex nature of the collision surfaces at small scales, or due to high-frequency vibrations of the body. Physics engines cannot follow small-scale features efficiently, so to reproduce a similar effect additional processes are required. One approach adopted is to calculate a grazing time for the duration of the complex impact. When the physics engine produces a clean impact, the time taken to bounce in and out of a grazing depth is , where is the normal velocity; see Figure 6. An acoustic contact activated for this period, in addition to the main impact, approximates the multiple interactions than can occur during an impact. Contact models that generate sequences of microimpacts stochastically are well suited for generating complex impacts. Impacts from high-frequency vibrations can be approximated by looking for where the distance between the receding bodies becomes zero. The separation distance consists of a linear increasing part due to the normal impact velocity, adjusted by the displacements given by the resonator outputs multiplied by a suitable scale factor (Figure 5). Another approach is to use recorded samples for the impacts, randomly selecting and mixing them according to impact strength. Lowpass filtering can be used to further simulate impact stiffness. This is a common technique, which becomes much more convincing when combined with contact synthesis with resonance matched to the impact recordings. Contact generation is a continuous process that requires regular parameter update over the contact life. As described in the review section, loop-based surfaces do not work well for many surfaces because the excitations consist of a series of microimpacts. At slower contact speeds, impacts loose energy, but they retain an impact profile. Recorded impacts that are resampled for slower playback have an overly prolonged attack time, and also the spectral changes are constrained. Increasing the recorded sample rate only partially addresses the problem and is not practical. A variety of alternative profile generation mechanisms have been explored, embedded within an template structure based on the model in ; see Figure 7. These models are designed to behave well for a wide range of contact speeds. 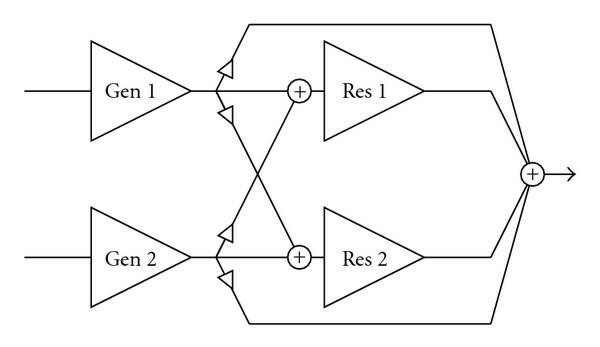 The lowpass filter shown is switchable up to fourth order. This enables convincing results in some cases discussed below, where the original 1st-order filter falls short. The filter and gain can be controlled by the slip speed, the normal force, and the effective surface elastic factor , using piecewise linear functions. An additional option is a onepole lowpass filter acting on the contact speed. This filter can be used to model exponential system energy decay in surfaces of a particle or fluid nature that take a while to settle once disturbed. The same kind of filter has been used in the percussion instrument models, . It can be used with any of the profile generators described below, introducing third dynamic layer, in addition to the physics engine macrodynamics and the audio rate microdynamics. These sounds have subtle granular characteristics that are difficult to synthesize or parametrize. For a sound designer, it is desirable to be able to select a recording and use this as a basis for simulation. The approach here is to modify a surface recording to match the contact kinematics. Resampling a loop is not an effective approach for many surfaces. Good quality time-stretching is more effective at preserving microimpact time profiles for different contact speeds. It is best applied by stretching loops recorded for slow speeds, when the impacts are most distinct, rather than compressing. Preprocessed loops with impacts already located allow the stretching process to be streamlined. In attempt to introduce more variation and control, stochastic granulation processes can be used to remix the microimpact grains. This is found to be difficult to do convincingly in a general way, as the sound structure is multiscale and easily disrupted. Playback at the original rate avoids the problem of stretching artifacts and can work surprisingly well, particularly with complex surfaces that are made of loose particles or fluid (example videos and software are accessible at http://www.cse.dmu.ac.uk/~dylan/). In these cases, the surface has intrinsic energy that is independent of the motion of other bodies on it, which can be modelled with a system decay process, excited by moving bodies. Contact speed becomes a factor for excitation energy in addition to slip speed. Even if a body is rolling, it can still be causing bulk displacement of particles or fluid. The filter can have the effect of lowering the apparent event rate as cutoff frequency is reduced, by attenuating events that have energy concentrated in high frequencies. This was true in most of the cases investigated, water surface, loose plastic, and gravel, and helps explain why stretching can be omitted. To control the perceived rate further without stretching, several samples with different event rates can be dynamically mixed. This is related to sample-based engine sound synthesis, except that here, samples are all played back at their original rate. For the water and plastic surfaces, the most convincing way to control the slip filter is to increase the cutoff with slip speed and contact speed. For dry leaves, this sounds unconvincing, and it is better to slightly reduce the cutoff and boost the gain to compensate. This creates a heavier sound when the leaves are agitated more. A physical explanation could be that increased agitation causes a greater proportion of the sound to be generated by leaves that are covered by upper layers. The sound from the lower layers is muffled by the upper layers. Also, the spring-release nature of the leaves means that the spectral profile of sound generated by each leaf quickly reaches a limiting state as excitation energy is increased. This is an example of how an intelligent sound design approach that benefits from physical understanding, but without detailed modelling. It is found that the system decay times must be set precisely to create the impression of various loose surfaces. This is straightforward to achieve with interactive adjustment. Phya includes some procedural profile models. The first of these generates a series of bumps of varying width, height, and separation. Bump width control is intended to allow variation of the spectral profile of the microcollisions, rather than to directly represent particle width. The width and separation are governed by Poisson processes. The Poisson rate parameters are made proportional to the contact speed relative to the surface so that the bump rate is also proportional as would be the case for a real surface. Figure 8 shows an example with Poisson rates for the mark and space. Bump profile governed by Poisson processes. The bump height can be controlled by an independent random variable or linked to the bump width. The less uniform the distribution the greater the impression of different surface particle groupings. The model is very simple, but it can produce a range of behaviour from smooth to gritty. It is sometimes desirable to have a surface that repeats consistently when the contact moves over the same area. This can be achieved using a procedural approach, such as indexed random variable generators with the index controlled by position. The main difficulty is in accurately calculating a suitable form of position variable from the contact parameters. A stored or procedural texture map can also be used. This can also be applied as a coarse grain parameter structure controlling the fine grained repeating or nonrepeating generators. Phya contains a related model that is useful for surfaces where there are many overlapping collisions between loose particles. This uses the PhISEM model,  together with the slip filter stage included in Figure 7. 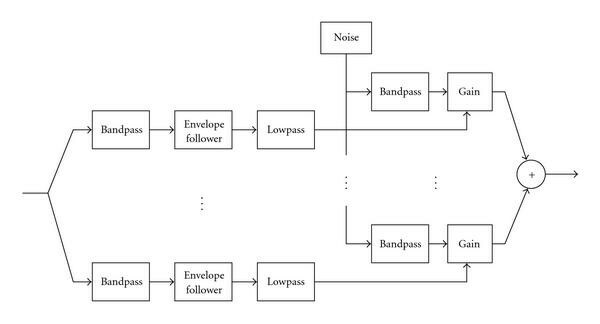 The PhISEM process, see Figure 9, begins with a raw collision rate that is then lowpass filtered, using the system decay filter already included in Figure 7. The Poisson event stream is filtered to generate a sum of exponential decays, which are then used to modulate a noise source, forming a summed stream of noisy hits. A biquad filter can be used to shape the overall spectrum and provide simple resonance where needed. Low system energy causes lower event rates and also a lower spectral center due to the slip filter. Convincing interactive surfaces can be synthesized for a range of gravel types, sand, paper, foil, and leaves, as demonstrated previously . One limitation is that at any time the population of all particles has the same energy and spectral characteristics, which sounds unnatural because a real population has a spread, as the bump generator does. A spread can be achieved by running concurrent generators with varying parameters, which happens anyway when there are distributed contacts between two bodies. In the foil example, each internal Poisson event triggers decay time and resonant damping and frequency. This simulates the transfer of energy into a new patch of foil enclosed and appears to give a strong cue for recognizing the foil. Again, multiple generators can improve the sound, as they can represent multiple resonant regions simultaneously. The parameters for this model can be varied to create a variety of different foil states. The most extreme cases where the foil is either uncreased or very creased require different models. Smooth frictional surfaces can cause characteristic stick and slip oscillation. This is implemented using a simple lateral elastic model, in which the surfaces stick until the lateral spring forces connecting the surface and main body exceeds a threshold depending on the normal force. The wave form generated is the lateral movement of the surface. The resonator can be incorporated to robustly produce. Resonator output can be fed back into the friction generator by offsetting the relative displacement of the surfaces, leading to characteristic mode locking and chaotic effects. Figure 10 illustrates this schematically. The dotted line represents the friction force driving the resonator. This is a much simpler model than found in , since there is no instantaneous solution of resonator with the contact interaction. Instead, the contact interaction drives the resonator, which then affects the contact interaction. This is reasonable because the resonator in general has a small response to instantaneous contact excitation, a significant resonant output is produced by sustained input. The behaviour is robust and interesting. Friction model with feedback to resonator. Buzzing and rattling are very common contact processes, caused by vibrating objects in light contact. Like stiff collisions, the result depends in a nonlinear way with the strength of interaction and so provides a distance-independent cue for that strength. Objects that are at first very quiet can become loud when they begin to buzz, due to the nonlinear transfer of low frequency energy up to higher frequencies that are radiated better and more noticeable. The buzzing process can be approximated by clipping the signal from the main vibrating object, as shown in Figure 11, and feeding it to the resonant objects that are buzzing against each other. This process can be applied in Phya as part of the mix in the output of a resonator, or in the bridge between two resonators interacting. The principle is similar to the vibration microimpacts during an impact. Clipping of resonator output to provide buzz excitation. There are many types of resonator structure that have been used to simulate sounding objects. For virtual environments we require a minimal set of resonators that can be easily adapted to a wide variety of sounds and that are efficient. The earliest forms of resonator used for this purpose were modal resonators [1, 2], which consist of parallel banks of second order resonant filters, each with individual coupling constants and damping. These are particularly suited to objects with sharp resonances such as solid objects made from glass, stone, and metal. It is possible to identify spectral peaks in the recording of a such an object, and also the damping by tracking how quickly each peak decays, . A command line tool is included with Phya for automating this process. Modal data is psychoacoustically meaningful and can be easily edited to extract, mix, or modify modes. Damping and frequency can be controlled globally. The coupling to each mode varies depending on where on object is hit. The simplest way to simulate this is with several collision bodies joined together, each with their own audio body. A more sophisticated and involved approach is to create different coupling vectors for regions of an object by comparing the modal responses taken from those regions. For a large enough object of a given material, the modes become very numerous and merge into a diffuse continuum. This coincides with the emergence of time domain structure at scales of interest to us, so that for instance a large plate of metal can be used to create echoes and reverberation. For less dense, more damped material such as wood, noticeable diffuse resonance occurs at modest sizes, for instance, in chairs and doors. Such objects are very common in virtual environments and yet a modal resonator is not efficiently able to model diffuse resonance, or be matched to a recording. Waveguide methods have been employed to model diffuse resonance either using abstract networks, including banded waveguides , feedback delay networks , or more explicit structures such as waveguide meshes [8, 22]. An alternative approach introduced in  is to mimic a diffuse resonator by dividing the excitation into frequency bands. The energy in each band is filtered with a onepole filter to model the energy decay of the diffuse resonance. 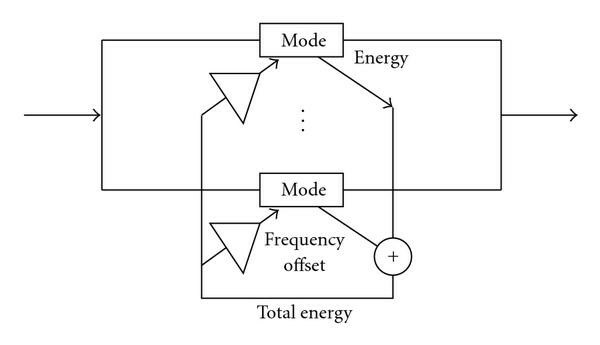 The resonant energy in each band then modulates a matching synthesized output noise band; see Figure 12. This perceptual resonator provides a diffuse response that responds to the input spectrum in a perceptually similar way to a linear resonator. Input at a given frequency excites output at that frequency. When combined with modal synthesis for lower frequencies, it can efficiently simulate wood resonance and can be easily manipulated by the sound designer. The structure is related to a vocoder, but with a noise source and band decay filters. The nonlinearity of resonators is sometimes clearly audible. For example, a gong excited with a soft mallet radiates a progressively higher proportion of high-frequency energy. Cymbals have chaotic crashing sound when hit hard, and in some, the pitch glides downwards as the overall amplitude decreases. These effects can be reproduced by solving directly with finite elements  or more efficiently by recasting in terms of modal interactions [10, 11]. In , the output of each mode is fed to a quartic polynomial, and the sum of these is fed back into each mode. This has complexity in number of modes. In , more flexibility is provided by allowing each mode to separately drive each other mode, with cost . Both cases must be carefully setup to avoid unstable feedback. Another structure for nonlinear resonance is presented here; see Figure 13. This does not have an explicit physical basis; however, it does have good properties in terms efficiency, stability, and intuitive calibration. The modes are divided into sections that are summed and fed to nonlinear functions. The outputs are fed forward to the next section. Feedback between modes is eliminated. Summing before the nonlinearity rather than after reduces the cost spent on nonlinear functions. More importantly, it results in a denser spectrum in the excitation signal passed to the next section, resulting in better transfer. For example, a quadratic function applied separately to modes results in at most frequency peaks. If the function is applied to the sum, there can be as many as peaks. In the above cases, the modal frequencies are all fixed, which prevents the simulation of pitch glides. Gliding can be simulated by controlling the resonator frequencies with an estimate of the overall resonant energy; see Figure 14. An instantaneous calculation of the energy is possible by summing the energies of the individual modes which can be found from their internal state. An increase of energy causes a reduction in resonant frequency, which is greater for lower frequency modes. The calibration can be made easily by a sound designer, which is not the case for an explicitly physical approach. There are some objects that are deformable, but still resonate clearly, for example, a thin sheet of metal or a pan containing water. Such objects have variable resonance characteristics depending on their shape. While explicit modelling of the resonance parameters according to shape is expensive, a simple effect that correlates well visually is to vary the frequency parameters, according to global variations in shape or strain tensor, as provided by the physics engine. A framework and a collection of dedicated audio processes have been presented for interactively generating the environmental sound of a system of colliding objects. The focus has been on techniques that can be applied realistically with current consumer technology, rather than future technology. This has involved a mixed bag of approaches and has been guided both by physical reasoning and critical listening. Such is the rich variety of natural sound generating processes; it is hard to see how these could be efficiently simulated by a more uniform approach. The ease with which a sound designer might calibrate sound objects has been a guiding consideration throughout. Gaining interactivity in sound is very valuable, but this has to be balanced against loss of authenticity when compared to recorded sound. It is hoped that the balance will continue swinging towards interactivity.